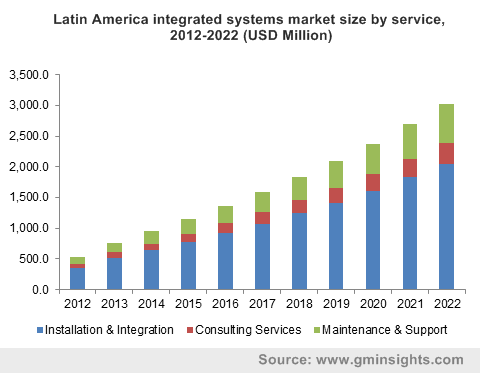 Integrated Systems Market size was valued at USD 9.5 billion in 2014 and is likely to reach over USD 30 billion by 2022, at a CAGR of 15.0% over the next seven years. Implementation advantages coupled with rising need to reassess data center infrastructure is anticipated to fuel the global industry demand over the forecast period. Shift in trend from mainframes to internet computing has changed the approach with which end-users purchase, consume, deliver and build technology. IT & telecom integrated systems market size was valued at over USD 2 billion in 2014 and is expected to exceed USD 7 billion by 2022. Implementation of these systems offers several benefits such as cost savings, high flexibility and simplified management mainly to the end-users. Hardware components including network equipment and storage server are optimized and designed to function in collaboration in order to reduce overall IT labor cost. Moreover, these systems could be easily managed with the assistance of a single console that simplifies automates workload, which in turn minimizes operational expenses. The above mentioned factors are likely to propel the demand growth over the coming few years. High cost of deployment is anticipated to hinder integrated systems market share over the next few years. However, the system maintenance operating expense and progressive operating cost are explicably low when compared to the archival counterparts. Installation & integration service was valued at approximately USD 6 billion in 2014. This can be primarily attributed to high demand across several small, medium and large-scale enterprises. In addition, increasing need for data center transformation is also likely to drive the demand over the forecast period. Consulting service offers consumers with a cost-effective capability where resources are allocated dynamically based on standards and new policies. It accounted for more than 16% of the overall integrated systems market share in 2014 and is expected to reach around USD 4.8 billion by 2022. Integrated infrastructure systems market was valued at over USD 4.5 billion in 2014, and is likely to surpass USD 15 billion by 2022. It accelerates return on investment and transforms traditional data centers to highly reliable, efficient and sustainable operations. Integrated platform systems are equipped with additional packaged software and pre-integrated customized system engineering in order to enable functions such as application development, storage, integration tools and testing. It is expected to grow at a CAGR of 14.8% from 2015 to 2022. Banking, financial services, and insurance industry was valued at USD 2.8 billion in 2014 and is expected to exceed USD 8 billion by 2022. This can be mainly attributed to high adoption rate over the forecast period. Retail industry supervises complete systems capabilities in store in order to reduce store system downtime. Moreover, it minimizes the overall cost of ownership with the help of proactive management of store systems. It accounted for over 18% of the total share in 2014 and is anticipated to exceed USD 5.8 billion by 2022. U.S. integrated systems market size is anticipated to exceed USD 10.4 billion by 2022. High market penetration coupled with technological advancements has surge the regional demand over the forecast period. Asia Pacific was valued at USD 2.5 billion in 2014 and is expected to grow at significant gains till 2022. India integrated systems market size is forecast to exceed USD 1.6 billion by 2022. Data center transformation mostly in emerging nations such as China and India has positively contributed towards the regional demand growth. The key participants include Oracle, IBM, and HP, which accounted for over 50% of the overall integrated systems market share in 2014. Other players include Accenture, Capgemini, Cisco, Deloitte, Hitachi, Huawei, and Fujitsu. Major competitors collaborate with virtualization vendors and cloud-based storage in order to expand the converged infrastructure installation.